Rear View Camera, Bluetooth, Steering Wheel Audio Control, Air Conditioning, Cruise Control! Edmunds.com says - With its recently improved cabin quality and handling, the 2017 Toyota Camry is a compelling and competitive midsize sedan. 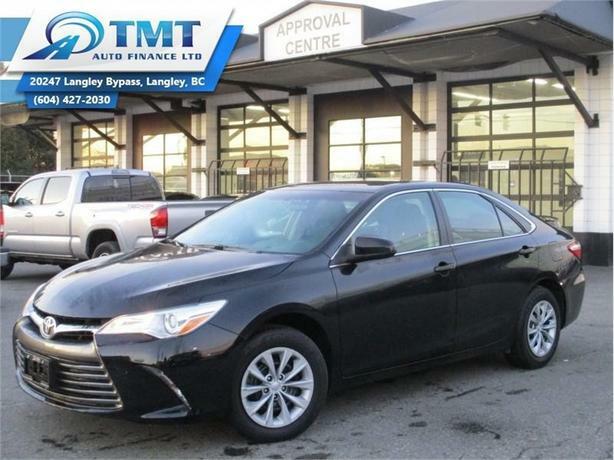 This 2017 Toyota Camry is for sale today in Langley. With a wide, athletic stance the 2017 Toyota Camry offers a striking exterior with a sophisticated and comfortable interior, complete with backup camera and upscale amenities. Thanks to its aggressive grille design, the Camry has excellent curb appeal while the expansive interior creates a sense of openness that offers plenty of head and legroom. Low noise and vibration levels on the interior, create a very comfortable ride for both the driver and passengers. To say the least, this Camry is SURE to please no matter what road you're on! This sedan has 51522 kms. It's black in colour and is completely accident free based on the CARFAX Report. It has an automatic transmission and is powered by a 178HP 2.5L 4 Cylinder Engine. This vehicle has been upgraded with the following features: Rear View Camera, Bluetooth, Steering Wheel Audio Control, Air Conditioning, Cruise Control. It has some remaining factory warranty for added peace of mind. Our Camry's trim level is LE. The 2017 Toyota Camry LE is well equipped including standard features such as 6.1 inch touchscreen audio, Bluetooth, 6 speakers, wireless streaming, backup camera, air conditioning, power windows, power locks, cruise control, tilt steering wheel and the Star Safety system.